I especially appreciate when an idea is courageous enough to venture into the “real world,” its “real problems” and “real communities” exponentially more apparent than in the temporally frozen space of an institution. Six @ Six was held in the Unpretentious Motor Inn with free Wi-Fi that is Motel 6. The rooms that were rented/parceled out were the six rooms closest to the entrance of the Motel itself. The show spaces were ground floor and all in succession to one another. I did not find much to engage with in a large percentage of the work exhibited in this show, which is not to be considered a demerit to the work itself. I believe regardless of what the work may have been about, I found myself put at an incredible distance from any of that prospective meaning by the mechanics of the works’ handling of the site. Some of the inconsistencies I find with the show become more apparent when it is compared to a haunted house (which the show could have been easily mistaken for). People were led in groups into highly thematized spaces where we witnessed various amounts of acting/performing. There was lots of laughter and an undeniable giddiness in the air. This is not successful in that most people go to haunted houses so that they may be entertained by being scared. In an endeavour to be entertained, most people pay for a modular experience and, with that awareness, the experience turns from one of being scared, saddened, or surprised to one of being entertained, which might be analogous to the modularity experienced when viewing art. It may have been this expected modularity that caused the motel rooms to feel more like sets rather than real spaces being responded to. If it was too scary, one could, at any moment, stop or remind themselves of the simulation’s presence. It is a form of spectacle that is especially apparent within performance; it either works or it doesn’t (it seems). What I found to be especially frightening was the light emanating from the second floor rooms atop the exhibition. It was suggestive of another presence outside of the work/the group of mostly young people. 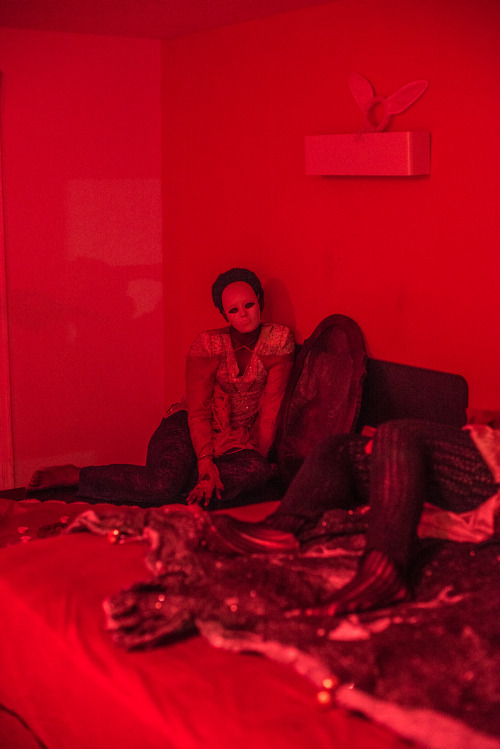 It would be wrong to assume that whoever was in those rooms was using them for the motel’s intended purpose; it may have in fact been for equally bizarre reasons as the show (though those reasons were hidden from the public eye). I believe the foreignness of the work being presented at the ground level led me to feel as though everything else was just: everything else. This is an imposition that I don’t think the show was interested in enacting. The art becomes the art and its spectacular showing is so loud that it groups everything else together as “other.” Motel goers become thematized into being exactly what we think of “them” to be. Despite some of those shortcomings, I found the sixth room of the show to be incredibly successful. The room, directed by Marcelline Mandeng, Keenon Brice and Emilia Pennanen was most striking in its avoidance of giving the viewer anything they would immediately expect or want, things they probably received in the rooms preceding. Viewers were denied the assumption that they, too, would have the same metaphysical implication of modularity, or distance, that we usually expect to have while looking at an artwork. The door was locked shut (though this was not the only room to do so) and the viewer waited to be allowed in. All three performers were wearing masks and rarely spoke. The door would fly open and Marcelline would quickly pull out a gun and hold it to viewers who were otherwise expecting to be allowed in (they were not). If they were lucky enough to be let in, they would be pushed to do things that some believed were pushing the boundaries of their own personal limitations. A woman was made to leave the room after having her hand dunked in what appeared to be a lube-like substance. A friend of mine was escorted out after having a pomegranate smooshed against his face and shirt while being told to call his mother and count to one hundred. Another friend of mine never got the opportunity to go inside the room because they never let her in. I even heard that someone was thrown in the shower and soaked. People want equity, people don’t want to get their clothes dirtied or to be treated in a way that might discomfort them in a nonconsensual way. That said, what could have been a better embodiment of the atmosphere exuding from Motel 6 for the two hours that the show took place? Emilia’s, Kenan’s, and Marcelline’s room remained in avoidance of becoming a spectacle because it remained true to the individual’s experience rather than focusing on the politics of curation or performance, politics that don’t register with importance given the site’s context. 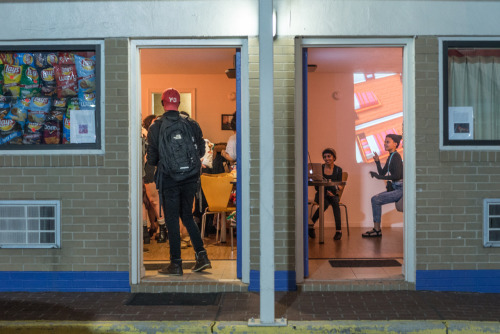 Six @ Six was a one night only group show at the Motel 6 on North Avenue, featuring six site-specific installations and performances. Work by: Forced Into Femininity, Julie Libersat, Sashenka López & Miguel Mendías, Marcelline Mandeng & Keenon Brice & Emilia Pennanen, Adam Void, and Laura Weiner. Curated by Miguel Mendías.